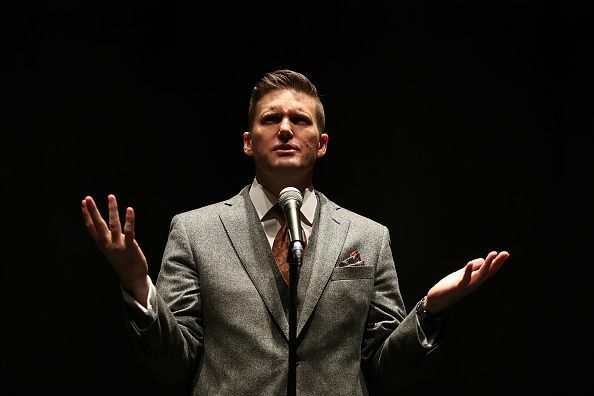 Richard Spencer has had a tough November: a few short days after his organization, the National Policy Institute, was booted from a Maryland farmhouse where they were holding an annual event, and losing his verification badge on Twitter, the white nationalist provocateur was kicked out of the better part of an entire continent. The Polish news site Niezalenzna, citing sources in the Polish Press Agency, said on Monday that the Polish Office for Foreigners banned Spencer for five years from entering an area that encompasses 26 countries, including prominent European hubs like France and Germany, as well as Poland. The Southern Poverty Law Center (SPLC) notes that the ban follows Spencer’s “failed attempt to visit Poland for the annual Independence Day march in Warsaw earlier this month.” Police estimated that 60,000 people participated in that annual march, which was held on November 11. The protesters came from all over Europe, according to local news accounts. “White nationalist and anti-Muslim sentiment was on full display,” SPLC noted in a press release. Spencer and other members of the so-called alt-right movement, which calls for limited immigration, mass deportations and a new state for only white people, have struggled to maintain a footing in American politics, following the chaos that took place at the “Unite the Right” rally in Charlottesville, Virginia in August. There, Spencer had been slated to be a speaker, but the event quickly devolved into violence. A 20-year-old man with ties to white supremacist groups was accused of murdering Heather Heyer, an anti-racist activist. Spencer returned to Charlottesville to stage a brief protest in October, and promised more in an interview with Newsweek, but has failed to deliver on it. He gave a speech at the University of Florida later that month, but a man with links to a planning document published by his organization was arrested for attempted murder there. Other prominent voices in the alt-right, like neo-Nazi propagandist Andrew Anglin, have struggled to stay online after being linked to the praise of domestic terrorism. Spencer told the Associated Press (AP) that he is being “treated like a criminal” for his beliefs. He says that he will contest the ban but it is unclear at this time how he would go about achieving that goal.